on new plants, products and people in China demonstrates a change in priorities. General Motors Co. (GM), the largest carmaker in the U.S., is shifting its center of gravity to China, where it sells more cars and now invests more money. GM’s announcement at the Shanghai auto show this month that it is spending $11 billion by 2016 on new plants, products and people in China demonstrates a change in priorities. Since its 2009 bankruptcy, GM has announced $8.5 billion of investment in the U.S., where it has a more modest assembly-plant footprint. GM’s focus on China parallels the strategy Toyota Motor Corp. (7201) employed in the last century, when the Japanese automaker poured investment in the U.S. market, where it saw its greatest growth potential. Now, Detroit-based GM is taking the lead in the world’s largest auto market by building four new assembly plants in China to boost its factory capacity to 5 million vehicles annually, twice what it sold in the U.S. last year. GM rose to a 52-week high of $30.71 last week. It rose 0.3 percent to $30.58 at 9:52 a.m. New York time. It gained 5.8 percent this year through April 26 compared with an 11 percent increase in the Standard & Poor’s 500 Index. The company will announce quarterly results May 2. GM already is the No. 1 automaker in China, with 15.1 percent of the market in the first quarter on growing sales of Buick and Chevrolet models and a thriving commercial-vehicle joint venture. 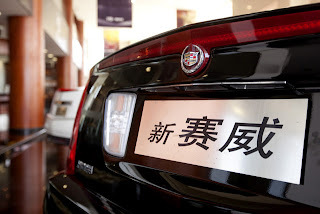 It’s rolling out 17 models there this year, including a renewed push to sell its Cadillac luxury line to the increasingly affluent Chinese. And it’s expanding its Chinese dealer network to 5,100, from 3,800. China is central to Chief Executive Officer Dan Akerson’s plan to diversify GM’s sources of profits around the planet. While North America remains GM’s biggest profit center, China has emerged as the leader in other key measures -- sales, output and investment. Analysts say it’s just a matter of time before China becomes GM’s biggest profit center. “It wouldn’t be difficult to see this flip sometime between now and 2020 for sure,” Jeff Schuster, an analyst with LMC Automotive, said of China’s potential to become GM’s profit leader. GM’s factory build-up will give it 17 assembly plants in China, said Bob Socia, GM’s top executive in the country, exceeding the 12 it has in the U.S. GM’s dealer count in China will also surpass the 4,343 showrooms it has in its home market. GM has been selling more vehicles in China since 2010. While China’s economic growth slowed to 7.7 percent in the first quarter, automakers still see it as an attractive market. Asked why GM is making such a large bet on China, Socia scoffed at the idea of a gamble. Even more bullish than others. While LMC forecasts the market reaching 32 million vehicles by 2020, GM predicts it will grow to 35 million by 2022. That’s up from 19.4 million last year. China in 2009 surpassed the U.S. market, where dealers sold 14.5 million cars and light trucks last year, the most since 2007. The U.S. record is 17.4 million in 2000.